Pictured from left to right: Walter J. Curran, Jr., MD, Mary Brock, John Brock, Madhav Dhodapkar, MBBS, Claire E. Sterk, PhD, and Sagar Lonial, MD. Madhav V. Dhodapkar, MBBS, director of Winship Cancer Institute’s new Center for Cancer Immunology and professor in the Department of Hematology and Medical Oncology, was honored as the inaugural holder of the Anise McDaniel Brock Chair. He was also named a Georgia Research Alliance Eminent Scholar in Cancer Innovation at a special ceremony held on February 5, 2019. 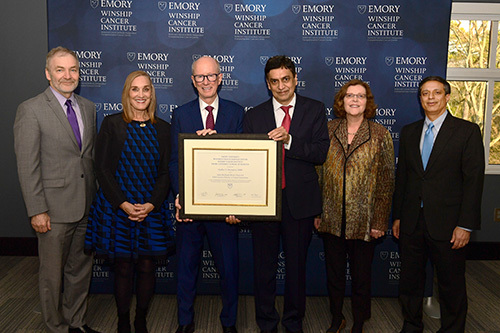 "Winship Cancer Institute and the Emory University School of Medicine are fortunate to have Dr. Dhodapkar leading our research efforts in cancer immunology," says Walter J. Curran Jr., MD, Winship's executive director. "We are grateful for his contributions as an academic leader and pioneering researcher." Dhodapkar, an internationally-renowned expert in cancer immunology and translational immunotherapy, focuses his research on harnessing the properties of the immune system to detect, prevent, and treat cancer. His research has helped to define the roles of the immune system in controlling early cancer cells and illuminates how the immune system regulates the progression from precursor lesions to cancer. "Our family is thrilled to honor Dr. Dhodapkar with this appointment. Cancer immunology is an important field of research in the fight to detect and treat cancer, and we are happy to lend our support," say Mary and John Brock, philanthropists and civic leaders. The endowed chair honors Mr. Brock's mother, a former Winship patient. Prior to joining Winship and Emory, Dhodapkar was the chief of hematology and the Arthur H. and Isabel Bunker Professor of Medicine (Hematology) at Yale University School of Medicine. He also served as professor of immunobiology and co-director of the Cancer Immunology Program within the Yale Cancer Center. He has authored over 100 scientific papers. In 2016, Dhodapkar received the National Cancer Institute Outstanding Investigator Award. He is a prior recipient of the National Institutes of Health Director's Transformative Research Award. Dhodapkar earned his medical degree from the All India Institute of Medical Sciences in New Delhi, India. He completed an internal medicine residency at St. Louis University and a fellowship in hematology and medical oncology at the Mayo Clinic in Rochester, Minnesota. He later served on the faculty at Memorial Sloan Kettering Cancer Center and The Rockefeller University in New York.